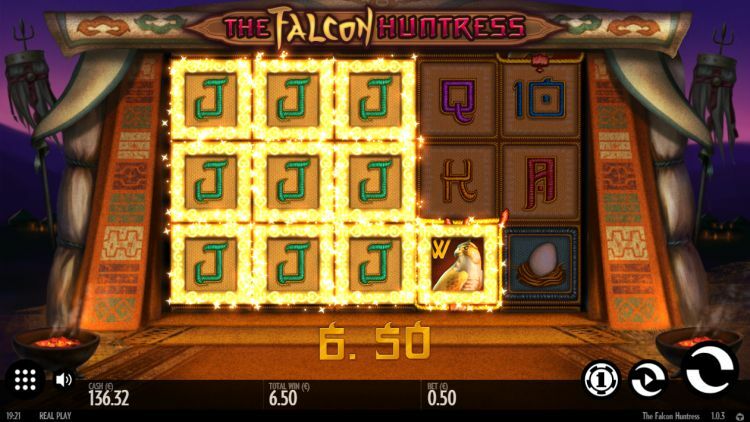 The Falcon Huntress is a super cool high variance video slot by Thunderkick. And what an amazing Thunderkick slot this has ended up becoming! The Asian warrior’s theme is really beautifully designed, with brave warriors, bows, falcons and much more. Besides the cool visuals, the game is fast, simple and especially adrenaline inducing. That comes courtesy of the expanding symbol feature, which is active in the primary game as well as the free spin bonus round. What this feature does is allow winning combinations to expand across the entire reel and that can lead to enormously big payouts. And when we say enormously big, that is precisely what we mean. How do you feel about a maximum payout of 10,050 x you bet? That number comes scarily close to the maximum bonus win in Dead or Alive, one of the most played high variance slots, ever. 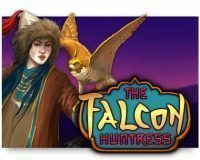 How does The Falcon Huntress slot work? The Falcon Huntress is not an extremely complicated slot. There are 9 fixed paylines, and the game is played with 5 reels that have 3 symbols per reel. The betting range is between $€ 0.10 and $€ 100, per spin. The payout rate of The Falcon Huntress is pegged at 96.1%. The variance is high, and that causes the game to be unpredictable. Our SuperBigWin top tip: make sure you put plenty of money down at the start if you want to play this cool slot with real money. 20 x to 40 x the value of your bet is not going to cut it, count on a minimum of 100 x your bet as a starting point. The theme for this slot is the Asian martial art, and that is reflected in the symbols. The Mongol warrior is the highest value symbol: get 5 of these on an active payline, and that amounts to 500 x the bet. The bow, the egg and the feather are good for 50 x, 75 x and even 100 x the bet. The card symbols 10, J, Q, K and A, range in value between 10 x and 15 x your bet. So big amounts; that is the crux of the matter. The falcon is the wild symbol and replaces all other symbols. 5 wilds on an active payline are going to lucrative as well: 200 x the bet. It is also this symbol that activates the free spin bonus. We’ll get back to that shortly. 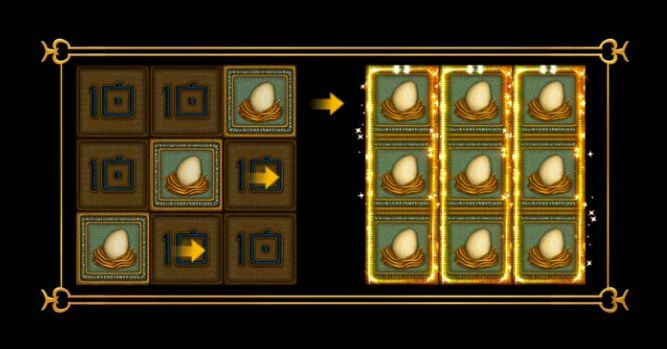 With every winning combination in the basic game, the Expanding Symbol Feature can be activated. We estimate that this happens about 20 % of the time. This feature ensures that all winning symbols expand over the entire reel. So, if you spin 5 of the same and win the feature, your screen will be entirely filled with the same symbols, and you will collect a 9 x payout. And that is on top of the original payout for 5 x the same. This feature reminds us somewhat of the Book of Dead or Magic Mirror bonus feature, except that in this case the very noticeable difference is that you can hit it in the primary game. The only symbol that can’t expand is the wild symbol. However, there can be multiple winning combinations and so also multiple expanding symbols. If you spin 3 or more wild falcons, you won the free spin bonus. This gets you 10 free spins with a chance of retriggers. During the free spin bonus, the winning symbols expand with EVERY winning combination. To be clear: you can win enormous amounts of money with this game. Naturally not every spin is going to result in the biggest prize of 10,050 x your bet, but 2,000 x – 5,000 x the bet can occur out of the blue. The Falcon Huntress by Thunderkick is a true top release which got us excited right away. The game looks really great, and because of the expanding symbols you can rake in prizes that can be multiple thousands x your bet at every spin. Graphically this video is a real beauty, things move smoothly, and the wild falcon plays a huge part in the game. Highly recommended and congratulations to Thunderkick with their terrific score for The Falcon Huntress! Where can you find The Falcon Huntress? 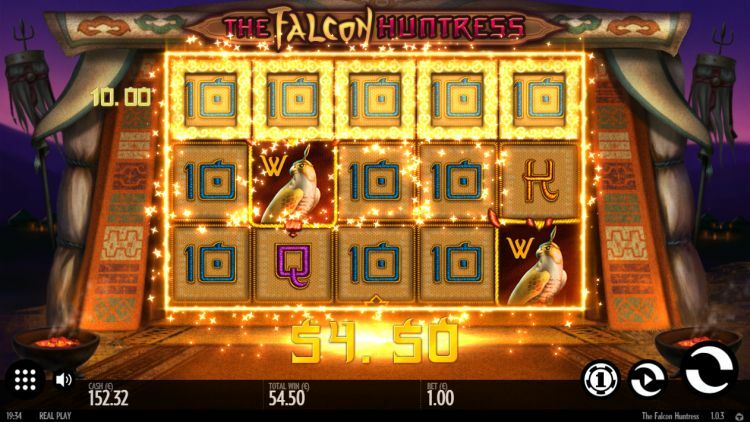 The Falcon Huntress slot is found at all reliable Thunderkick casinos. One of these Thunderkick casinos is Casumo, which is one of our favourite online casinos. 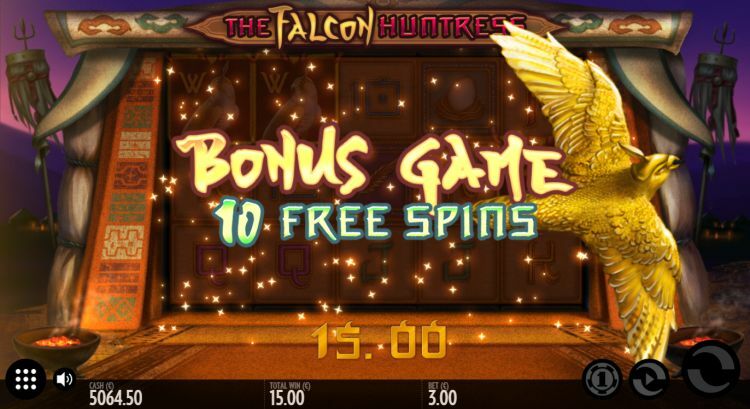 You can play the The Falcon Huntress slot at Casumo with a 200% bonus up to $€50 plus 200 free spins.